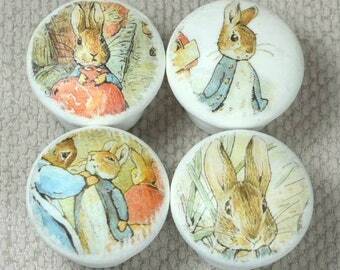 Beatrix Potter, Peter Rabbit, Flopsy Bunny Wooden Knobs, perfect for Drawer Handles or Dresser Knobs in baby Nursery, 35mm Dia. Custom Map Coasters : UK, Europe or Worldwide. Free Gift Tag. Perfect Housewarming or Birthday Gift. 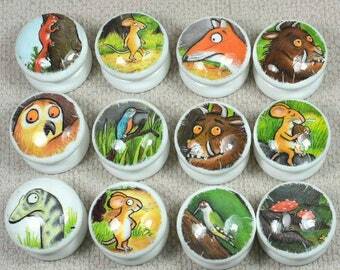 Gruffalo Knobs, Handpainted Knobs, Wooden Drawer Knobs, Gruffalo Drawer Pulls, 3.5cm dia. 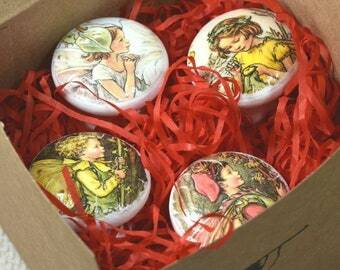 Announcement I have a great selection of handmade items such as handpainted Drawer or Dresser Knobs with either Beatrix Potter/Peter Rabbit characters or Floral Knobs, Alice in Wonderland Money Boxes using illustrations from books, Map Coasters - you choose your locations! and my favourite items and my newest venture of Succulent/Cacti Pots; encompassing a love of collecting succulents with another favourite pastime, working with clay. I have always loved wrapping presents, and I love gift wrapping orders with beautiful paper and ribbon, all of which is a free extra with the dual purpose of protecting your purchase and looking lovely on arrival. If you need a Gift Tag, either blank or with words of your choice, just let me know - at no extra cost. I am always thinking up new ideas but if there is something you'd like me to create for you, just send me a message - I would be happy to chat over a custom order. 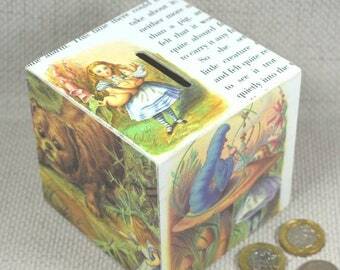 I have a great selection of handmade items such as handpainted Drawer or Dresser Knobs with either Beatrix Potter/Peter Rabbit characters or Floral Knobs, Alice in Wonderland Money Boxes using illustrations from books, Map Coasters - you choose your locations! and my favourite items and my newest venture of Succulent/Cacti Pots; encompassing a love of collecting succulents with another favourite pastime, working with clay. 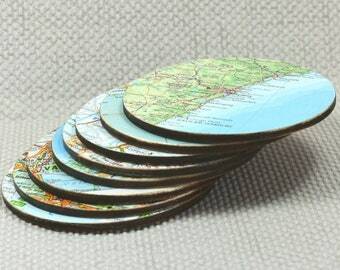 Map Coasters, choose your locations : UK, Europe or Worldwide. Comes in a Presentation Box + Free Gift Tag. 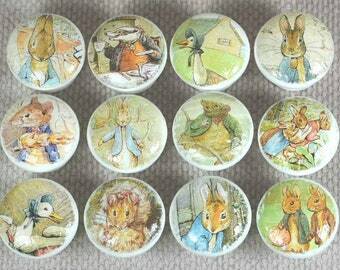 Large Handmade Peter Rabbit/Beatrix Potter Party Labels, ideal for Birthday Party Bags or as Gift Tags, Sets Available. 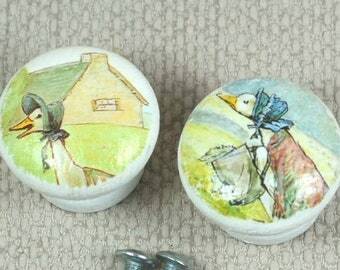 Handpainted Kids Knobs, Wooden Knobs, Drawer Handles, Dresser Knobs, 3.5cm dia. Sets Available. 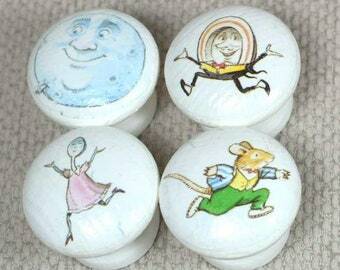 Nursery Knobs, Kids Furniture knobs, Kids Knobs, Drawer Pulls, 3.5cm Dia. Adorable! I can't wait to use it for his birthday!!! I first started applying paper to objects over 25 years ago not realising then, that this was known as 'decoupaging' - the art or craft of decorating objects with paper cut-outs. It's a well known fact that if you're even vaguely creative - you need to create something! And after exhausting family and friends with handmade gifts, someone wisely nudged me in the direction of Etsy. Nearly 4 years later, I'm so glad they did. With an established Etsy shop with over 1160 sales, my own website www.quirkyartshere.co.uk and now on Amazon Handmade. I am crafting every day at home. How lucky am I! 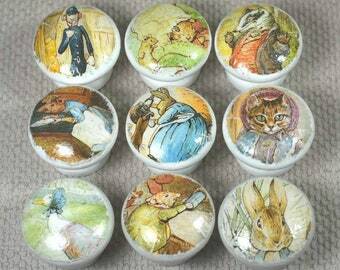 I have a great selection of handmade items such as handpainted Drawer or Dresser Knobs with either Beatrix Potter/Peter Rabbit characters or Bumblebee, Owl or Alice in Wonderland Knobs, as well as Alice in Wonderland Money Boxes using illustrations from books, and finally Map Coasters - you choose your locations! After years of creating for friends and family, I opened QuirkyArtsHere 3 years ago, and I'm so glad I did. I love etsy and I love crafting. I've really enjoyed expanding my range and always delivering top notch customer service. To complete your order on time you are required to provide personal information (which you authorised Etsy to provide to me), such as your name, email address, postal address, payment information (never bank details), as well as the details and cost of the product you are ordering. 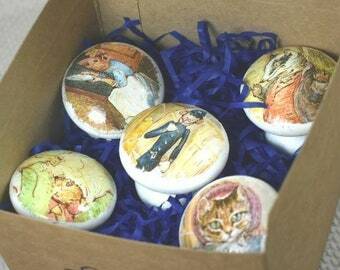 For custom orders you may also require to provide further information via etsy messages. Your personal details are used so I am able to process your order and post via Royal Mail, for UK and Europe orders and UK Mail Courier Service if in the US or Canada. The information displayed will be your name and address. All packages are securely sent with no personal information written inside. I enjoy individual custom orders, often you the customer have the best ideas! so if you have an idea that you would like to discuss with me, just convo me - I will be happy to help. I send out your item gift wrapped as standard with beautiful paper and ribbon, all at no extra cost, this can include a hand drawn Gift Tag- let me know as not automatically added ☺ I love drawing and my gift tags are cute! I post out your item using Royal Mail, transit time approximately 2/3 working days for UK. 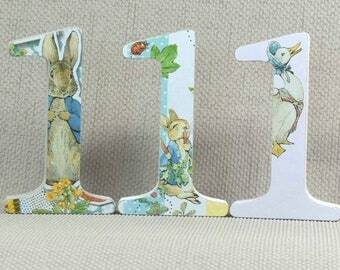 Made to Order items such as the Nursery Letters take 1 - 2 weeks from purchase. Custom items also have a processing time of 1 - 2 weeks, I will keep you posted on progress for Made to Order and Custom items. Returns are accepted on non-custom and non-personalised items, just contact me with 14 days of purchase and return item (unused and in original condition) within 30 days of purchase. 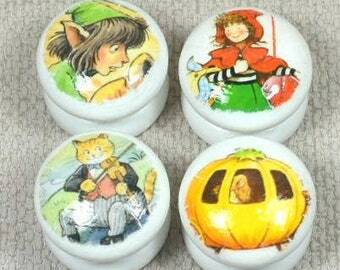 Once item is received I will issue refund for item and original postage. Returns postage is buyer responsibility if item is not faulty or damaged, please mark parcel with 'RETURNS' this is especially important for US customers. If this is not done, custom charges will be applied and this cost will be deducted from the refund. So please if in the event of a return, mark parcel with 'RETURNS'. Any issues, please contact me and I will be happy to help. My Name Tag won't stay up! Any tips when tying it to the Letter? Yes, I have a great tip. The letter is completely sealed so is in no danger of being marked if you use this simple trick to keep the Name Tag upright once tied to the letter. Use a tiny piece of blu tack or similar, on the edge of the tag nearest the letter and gently press once tag is in a position you'd like. The blu tack won't mark the letter due to the sealant and the tag should stay put! I've painted my furniture a different colour to white, can you match this with your knobs? Yes! No problem at all. 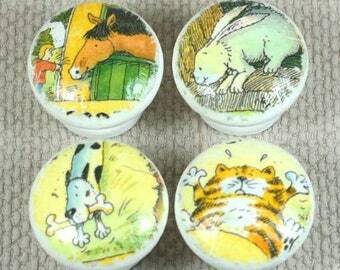 Just let me know the colour and if possible, the brand you used and I will paint the knobs in whatever colour you've used - either using exact same colour or as close a match as possible - all at no extra cost. Oh no! My parcel has arrived damaged!! What do I do? Hi, firstly this has been a very rare occurrence in the last two decades I have been selling online (ebay/etsy) however it does happen once in a while and if it's happened to you, don't worry here is what we will do. Secondly, take pics of damaged item itself. Send all pics to me which I then forward to courier/Royal mail, to start a claim for damages. In the meantime, I will either send out a replacement if able, or fully refund - whichever you want. This cannot be done without pics though, so it is really important that you take pics as soon as damaged parcel has arrived.